The AtKisson Group is one of over 1,000 “non-state actors” (cities, businesses, NGOs etc.) to have formally signed a pledge to support the Paris Agreement on climate change. AtKisson Group will be highlighting the Paris Agreement in all its consulting and training activities and, of course, continuing to review our own policies and practices with regard to CO2 emissions. 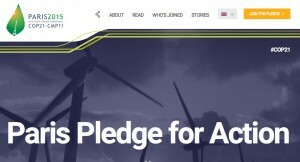 For information on this pledge, see the Paris Pledge for Action website. About our climate change policy: Currently, AtKisson Group headquarters is zero-emissions (powered completely by wind energy), and all travel associated with AtKisson, Inc. or AtKisson Europe AB activity is screened through an analysis filter for net impact on CO2. Travel in Sweden is generally restricted to rail, electric car, and public transport. Air travel is reviewed for the possibility of the engagement to result, directly or indirectly, in reduced CO2 emissions. Occasionally we undertake CSR projects that also have the potential to result in direct CO2 reduction, such as financing conversions of small energy systems from fossil to renewable; and our main CSR initiative, 17Goals.org, includes an emphasis on climate issues as one of the 17 SDGs. We look forward to working with all our clients and colleagues in the years ahead to ensure that the Paris Agreement holds, and is implemented.